Place the drill portion of the saw near the stem area of the gourd. Use steady, even pressure to drill/saw the opening. Use a file or sandpaper to gently smooth any rough edges, and then clean the inside of the gourd . Step two: Cut a small disc of pine or other scrap wood to act as a stopper. Use a compass to draw a circle that is as close to possible to the size of the finished opening. (You want the lid to fit snugly when it is done, so don't cut it too small.) 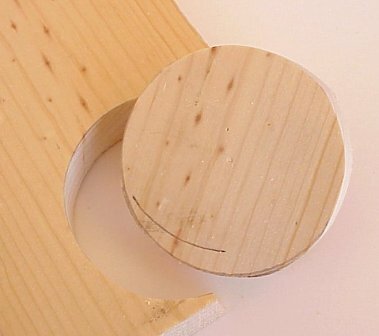 The stopper may be filed or sanded to fit properly if it is a bit too large for the hole. Step three: Method 1 - Use a scrap piece of gourd that is larger in diameter than the opening in the gourd to serve as the lid base. 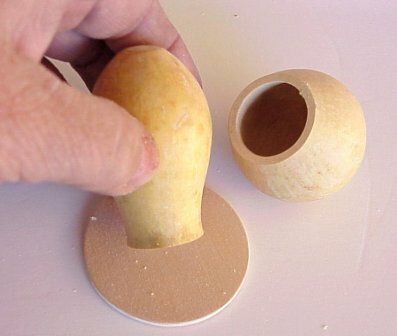 Choose a piece that was removed from another gourd and has a nice shape. 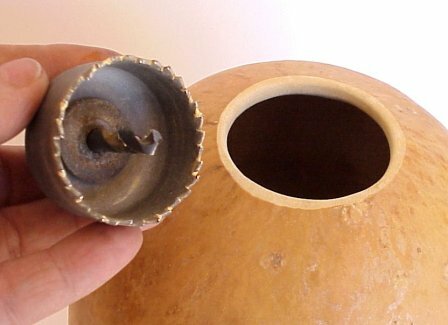 Method 2 - Alternatively, select a gourd piece or other material that is smaller in diameter than the opening, which will serve as the top. Back it with another thin piece of wood that won't drop into the gourd. (See below) I used 1/8" basswood for this piece which will serve as the lid. A small, bulbous shaped gourd scrap can function as handle for the lid, or use a gently domed scrap and add a handle made from wood, antler or other material. Step four: Glue the wooden stopper disc to the bottom of the lid. Use good quality wood glue and clamps to ensure a good bond. You can fill any little gaps later with wood filler if needed. Finally, glue a handle to the top of the lid. The gourd on the left has a lid made from a small disc of basswood and a gourd knob. 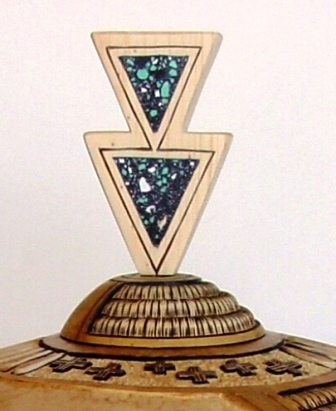 (The larger pine stopper fits inside the gourd opening and can't be seen in the photo.) The gourd on the right has a lid made from a basswood disc, and has a decorative top made from a wood square with a scrap piece of gourd glued to either side. 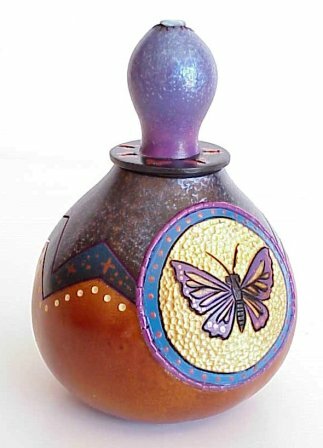 For an extra fancy lid, use a special decorative piece that you have made from wood or other material. After cutting the material to size and shape, drill a hole in the bottom of the piece and in the top of the domed lid. Use a dowel and wood glue to assemble the parts and clamp. 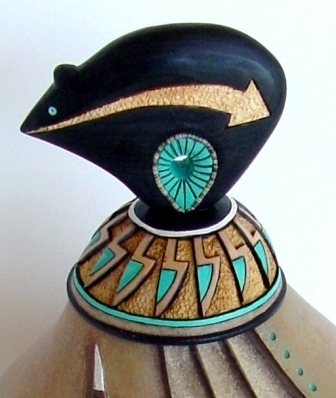 Two examples of lids made with a large gourd scrap (wider than the hole in the gourd) and an added decorative wooden top. 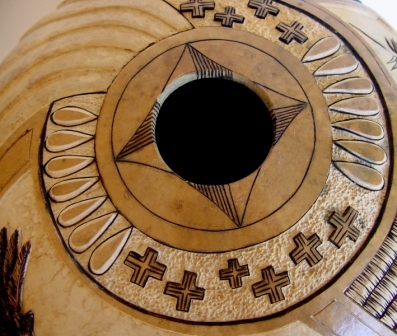 The geometric piece on the left has been further decorated with inlaid stone, and the gourd scrap lid has been carved. The fetish bear on the right has been carved from wood and the gourd scrap lid has been carved and painted. 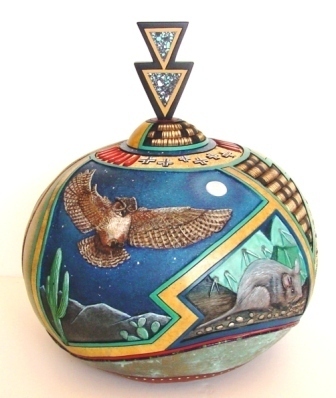 Opening of gourd before painting and adding lid. 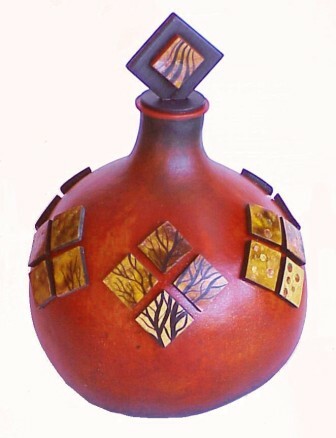 Gourds vessels and bowls are even more beautiful when you add a decorative lid! Instead of cutting the lid from the gourd itself, you can make a decorative added lid with stopper using gourd scraps and scrap pieces of wood. This technique can be used on any gourd shape, but it works especially well with canteen and kettle gourds. You will use 3 parts in creating your lid: the stopper, the lid, and some type of top or handle. Tools needed: Hole saw, compass, drill, scroll or jig saw.